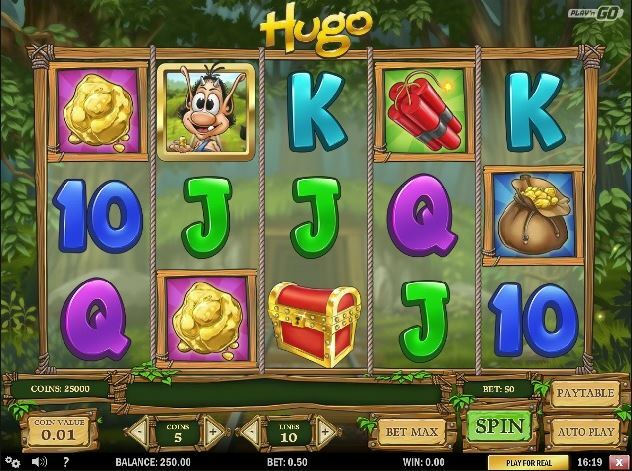 Hugo is a 5 reel, 10 payline online video slot powered by Play’n GO. Hugo is the slots wild symbol and the evil witch Afskyliais is the Scatter symbol, and an additional Scatter as Hugolina. The treasure chest is a bonus symbol and can grant you with a fun bonus game! Hugo himself is the games´ Wild symbol, and he can grant you with some great wins. He steps in to replace all symbols, apart from the bonus and the Scatter symbol, to create winning combinations for you. He can also turn up in the free spin feature to double your wins there, and give an even higher win! The plot of Hugo is to guide this troll to help save his wife Hugoline and his three children Rit, Rat, and Rut, from the oh so evil witch. She is holding them all captive, and to rescue them Hugo must navigate safely through various dangerous and harsh environments in different minigame scenarios. During the game, Hugo will communicate with you through digital speech and can both knock and scratch on the screen from inside, just like the intro of this video slot. So, are you ready to yet again help save Hugo´s family and eject the evil witch out the window?! Hugo offers some rewarding and incredibly fun features, one of them is the Treasure bonus feature. This is activated when you manage to land the treasure chest symbol on reels 1, 3, and 5. When this happens, you will be transported to a different screen where you are presented with four doors down in the gold mine. Your goal is to find the treasure chamber. Choose the door you feel is hiding the treasures, the gold coming hiding inside the doors will be added to your balance as you enter the rooms. One thing you need to know, though, is that you need to look out for Don Croco, if he turns up, he can end your bonus round! But the round continues until he comes along. You can win both coins and up to 150x your bet in the Treasure bonus. When you manage to get three or more of the evil witch Afskylia on the reels, you will activate the free spins feature. But not just any kinds of free spins! When the free spin feature starts, you are presented with three options; to choose 5 free spins with a 3x multiplier, 10 free spins with a 2x multiplier, or 15 free spins with a 1x multiplier. During the free spins, there is also an extra Scatter symbol, this is Hugoline. She can turn up stacked on any reels at any given time, granting you with major wins. And if you land yet another three witches, you will get the amount of free spins you chose, again.